The neotectonic evolution of the Antarctic Peninsula and Scotia Sea is extremely complex. Understanding the recent evolution of the Drake-Scotia-Antarcticia-South America plate intersections will provide important information as to how major plate boundaries reorganize after demise of a long-lived spreading center and the consequential reduction in the number of plates. The plate reorganization probably resulted in the uplift of the Shackleton Ridge which may have effected the sedimentary patterns in both the Scotia Sea and possibly the Weddell Sea. If the break of the Shackleton transform fault can be traced with multibeam and sidescan sonar as it intersects the southern end of South America then the orientation and geometry of the faults, fractures and deformation as the transform fault intersects the South American continent will help to interpret the structures in that complex region. ANTARCTICA IS THE EARTH'S most isolated continent. It is surrounded by actively spreading ridges except in the South American sector. The motion of South America with respect to Antarctica is latitudinal and left-lateral at approximately 22 mm per year and is distributed along the boundaries of the intervening Scotia plate. "Collaborative Research: Scotia Arc GPS Project (SCARP)"
The new multichannel seismic (MCS) data reveal a complex array of rifting styles short of clearly-defined sea floor spreading. The Strait is undergoing basinwide extension. While E-MORB basalts have been dredged from en echelon topographic highs in the NE part of the basin, available seismic evidence does not support the formation of oceanic crust there. Volcanic crust acoustic signatures at known axial deep highs also extend laterally sub-sea floor; their distribution and style of intrusion support propagation of volcanism and associated extension from NE-to-SW. Active extensional structures along both margins control a strong physiographic asymmetry. The South Shetland Islands margin is comprised of a few, closely-spaced, large-offset normal faults; the gentler Antarctic Peninsula margin exhibits broader, distributed extension. To the NE, normal fault polarity reversals (NFPRs) dominate; listric faults sole into NW-dipping, low-angle reflectors interpreted as detachments. To the SW, larger NFPRs and convex-up geometries up to ~20 km across suggest broad uplift rather than detachment-based extension. Structural relief is also subdued in the SW. We suggest that such uplift precedes sea floor volcanism and rapid associated deflation along detachments. This coupled uplift/deflation, and the observed overall NE-to-SW propagation of rifting, leads to ~NW-SE trending accommodation zones segmenting the basin along-strike. Locations of these accommodation zones may be determined by structural grains in the preexisting crust. Observed extension in Bransfield Strait may result both from plate boundary tectonics at the South Shetland Trench and at the evolving Antarctic-Scotia plate boundary. Extension was probably initiated by onset of subduction rollback at the trench, as a slab window opened from the SW. Rollback of older, subducting lithosphere at the trench's NE end is therefore more rapid, thus driving SW-propagating extension. Left-lateral transtension as a result of reorganization of the triple junction at the intersection of the Shackleton Fracture Zone and South Scotia Ridge may also augment extension in NE Bransfield Strait (from the Abstract - Barker and Austin, Journal of Geophysical Research, in press). Departamento de Geodinámica. Universidad de Granada. 18071 Granada. Instituto Andaluz de Ciencias de la Tierra (CSIC-Universidad de Granada). 18071 Granada. Palabras clave: Cuenca Powell, Arco de Scotia, Evolución de cuencas oceánicas. Key words: Powell Basin, Scotia Arc, Oceanic basin evolution. La corteza oceánica y los márgenes continentales de la Cuenca Powell se han estudiado mediante los perfiles de magnetometría, sísmica de multicanal y ecosondas de la campaña HESANT 92-93 y el mapa de anomalía de aire libre de GEOSAT. El eje de expansión oceánica es arqueado, está formado por dorsales en relevo y está cubierto por más de 1.5 s (TWT) de sedimentos. El margen septentrional, con un único escarpe, y el meridional, escalonado, son rectilíneos y se interpretan como transcurrente y transtensivo, respectivamente. Los márgenes oriental y occidental, arqueados y con corteza intermedia, se consideran márgenes pasivos conjugados. El carácter desnutrido y la mayor pendiente y profusión de fallas recientes del margen oriental sugieren que el rifting fue asimétrico, con un despegue de buzamiento hacia el Este. El rifting pudo comenzar a partir de finales del Cretácico y la expansión oceánica, de dirección ENE-WSW, tuvo lugar entre el Eoceno tardío y el inicio del Mioceno. La Cuenca Powell se desarrolló simultáneamente a la Placa de Scotia. La expansión oceánica en el interior del Arco de Scotia fragmentó y dispersó en su entorno la corteza continental que unía Sudamérica y la Península Antártica a principios del Eoceno. La formación de cuencas oceánicas de pequeñas dimensiones con cortos periodos de expansión se ve probablemente favorecida por la migración de bloques continentales a lo largo de sistemas transformantes, con deformación distribuida, entre placas mayores. Zona de unión triple de las placas tectónicas Antártica/Scotia/Phoenix. The Powell Basin is a small oceanic basin nearly totally surrounded by continental crust. Analysis of magnetic, multibeam echo sounding and multichannel seismic profiles obtained during the HESANT 92-93 cruise with the B/O Hespérides, in addition to the GEOSAT free air anomaly map, has allowed us to study its margins and basin plain. An arched oceanic spreading axis, with a mean NNW-SSE trend, subparallel to the eastern and western margins, is identified in the oceanic crust. This axis is formed by several overlapping ridges that are covered by a 1.5 s (TWT) sequence of post-drift sediments. The basin margins and axis features suggest that the Powell Basin opened in an ENE-WSW direction. The northern and southern margins are straight, with steep slopes. While only a single ENE-WSW large slope is found in the northern margin, orthogonal to the spreading axis, the southern margin has E-W direction and a staircase profile with perched basins. This geometry suggests that the northern margin is transcurrent, while the southern one is transtensional. The eastern and western margins are arched, with intermediate crusts, and may be interpreted as conjugate passive margins. However, the eastern margin is more starved, and has steeper slopes and more intense recent faulting than the western margin. This variation in features suggests that the rifting probably was asymmetric, with a basal detachment dipping towards the eastern margin. ODP, heat flow and ocean basement depth data suggest that the drift period of Powell Basin occurred between the late Eocene and Lower Miocene. Rifting may have started at the end of the Cretaceous. The end of the oceanic spreading after the Lower Miocene and the absence of seismic activity in the margins suggest that the basin is now mainly undergoing a thermal subsidence period. However, the recent activity in the faults of the eastern margin may suggest the existence of a short recent reactivation stage. The development of Powell Basin is contemporaneous to the spreading of the Scotia Plate. The origin of the Powell Basin is related to the formation of the Scotia Arc. The oceanic spreading inside the arc dispersed the fragments of continental crust that once formed the connection of South America and the Antarctic Peninsula in the Eocene. The development of small oceanic basins, during short periods, may have been favoured by the existence of transcurrent boundaries between major plates with oceanic and continental crusts. The displacement of continental fragments along the plate boundaries can generate fast evolving oceanic basins such as the Powell Basin. Bol. R. Soc. Esp. Hist. Nat. (Sec. Geol. ), 93 (1-4), 1997, 31-41. Palabras clave: Bloque de las Shetland del Sur, Placa Antártica, Límites convergentes y divergentes. Key words: South Shetland Block, Antarctic Plate, Convergent and divergent margins. 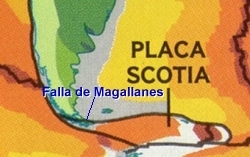 El Bloque de las Shetland del Sur es un elemento activo en la región de contacto entre las placas Antártica, de Scotia, y la antigua placa Phoenix. Su límite N-NO es la Fosa de las Shetland del Sur. Este es un límite convergente activo que evoluciona hacia el E a una zona de falla transpresiva sinistra que sigue el talud septentrional de la Dorsal Sur de Scotia. Su límite S-SE es el rift del Estrecho de Bransfield, que hacia el E se convierte en una zona de falla transtensiva sinistra. Las deformaciones internas del bloque incluyen pliegues desarrollados en las zonas donde subducen relieves positivos de la Placa Antártica (zonas de fractura Shackleton y Hero). La inexistencia de un límite suroccidental neto, el mecanismo de expansión difuso en el rift del Estrecho de Bransfield, y el pequeño tamaño del bloque sugieren que no es una placa independiente, sino que está conectada a la Placa Antártica. La variación de la cinemática de los límites que pasan de tener un carácter de salto en dirección dominante a movimientos según el buzamiento, puede deberse a que se comporta como un único bloque pero con límites de orientación variable de E-O a NE-SO. The South Shetland Block lies in the boundary between the Antarctic and Scotia plates, and the former Phoenix Plate. The N-NW boundary is the South Shetland Trench. It is an active convergent margin that towards the East changes to a left-lateral transpresive fault zone in the northern continental slope of the South Scotia Ridge. The S-SE boundary is the rift of Bransfield Strait, which is converted into a left-lateral transtensive fault zone towards the East. The internal deformations of the block include folds in the areas where positive reliefs of the Antarctic Plate (Hero and Shackleton fracture zones) are subducted below the block. There are also faults with a normal component which developed small basins in the eastern sector of the block. The absence of a distinct southwestern boundary, the diffuse mechanism of spreading in the rift of Bransfield Strait, and the smallness of the block suggest that it is not an independent plate, but an element of the Antartic Plate. The variation of the kinematic of the boundaries from a predominant strike-slip character to dip-slip motions may be due to the fact that it acts as an only block but with boundaries with variable trends from E-W to NE-SW.
Bol. R. Soc. Esp. Hist. Nat. (Sec. Geol. ), 93 (1-4), 1997, 43-51. We have created a digital age grid of the ocean floor with a grid node interval of 6 arc-minutes using a self-consistent set of global isochrons and associated plate reconstruction poles. The age at each grid node was determined by linear interpolation between adjacent isochrons in the direction of spreading. 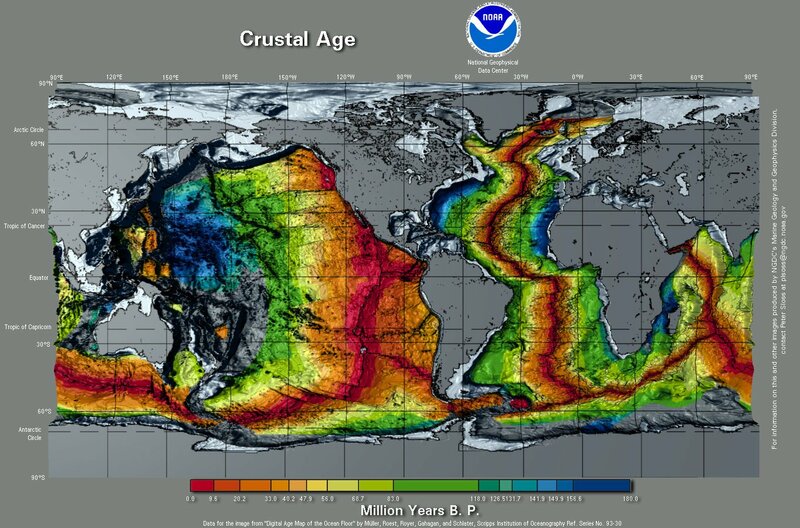 Ages for ocean floor between the oldest identified magnetic anomalies and continental crust were interpolated by estimating the ages of passive continental margin segments from geological data and published plate models. We have constructed an age grid with error estimates for each grid cell as a function of (1) the error of ocean floor ages identified from magnetic anomalies along ship tracks and the age of the corresponding grid cells in our age grid, (2) the distance of a given grid cell to the nearest magnetic anomaly identification, and (3) the gradient of the age grid, i.e. larger errors are associated with high age gradients at fracture zones or other age discontinuities. Future applications of this digital grid include studies of the thermal and elastic structure of the lithosphere, the heat loss of the Earth, ridge-push forces through time, asymmetry of spreading, and providing constraints for seismic tomography and mantle convection models. The age of the ocean floor is an important parameter in the study of plate tectonic processes. An accurate digital age grid is essential for many studies, including plate kinematics, studies of plate driving forces, mantle dynamics, ocean floor roughness and paleoceanography. Several analog maps of the age of the ocean floor have been compiled using magnetic anomaly data [e.g., Sclater et al., 1981; Larson et al., 1985]. A digital version of the latter map was produced by Cazenave et al. , at a grid interval of half a degree (approx. 55 km). Recent improvements in identifications of magnetic anomalies and plate kinematic models, especially aided by dense gravity data from satellite altimetry, permit a more detailed description of the spreading process, and have initiated the construction of a more detailed age grid. We have constructed a global set of isochrons for the ocean basins corresponding to magnetic anomalies 5, 6, 13, 18, 21, 25,31, 34, M0, M4, M10, M16, M21, and M25 based on a global plate reconstruction model, magnetic anomaly identifications and fracture zones [see also Royer et al., 1992]. The geomagnetic time scale of Cande and Kent  was used for anomalies younger than chron 34 (83 Ma), the time scale from Gradstein et al. for older times. Isochrons were constructed by plotting reconstructed magnetic anomaly and fracture zone picks, as well as selected small circles computed from stage rotation poles for each isochron time, keeping one plate fixed. Then best-fit continuous isochrons were constructed, connected by transforms, in the framework of one fixed plate [see also Müller et al., 1991]. A complete set of isochrons for all conjugate plate pairs was derived by rotation of every isochron to their present day position. Construction of a complete age grid also requires knowledge of the present day plate boundary geometry. The boundaries shown in Figure 1 have been compiled based on a marine gravity grid from Geosat exact repeat mission, Geodetic Mission, and ERS-1 satellite altimetry data [Sandwell et al., 1994], bathymetric data, and Earthquake epicenters. There is a significant area of ocean floor that is older than the oldest mapped isochrons. 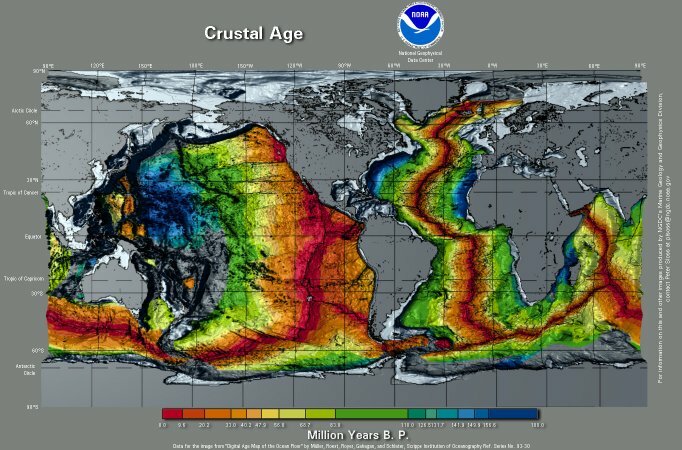 In order to estimate ages for the oldest ocean floor in ocean basins bounded by passive margins, we assigned ages to continental margin segments based on geological data and published plate models. The regional boundaries between continental and oceanic crust have been compiled in Müller and Roest  (North and central North Atlantic), Nürnberg and Müller  (South Atlantic), and Royer et al. (Indian Ocean). South of 60°S a dense grid of Geosat Geodetic Mission data [Sandwell et al., 1994] has been used to better locate boundaries between continental and oceanic crust in remote areas such as the Antarctic continental margin. 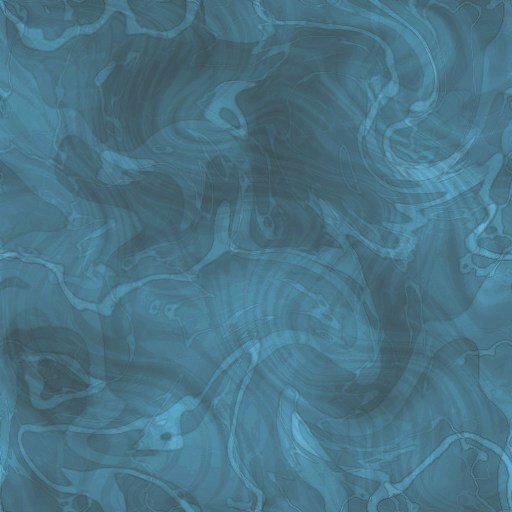 In order to create a smooth grid of ocean floor ages that maintains all sharp age discontinuities at fracture zones, we first create a set of densely interpolated isochrons. We assume that the spreading direction between two adjacent isochrons is given by a constant stage pole of motion, derived from our plate kinematic model. We also assume that the spreading velocity between two adjacent isochrons is constant, and that consequently the age varies linearly in the direction of spreading on a given ridge flank. To simplify the calculations, each pair of adjacent isochrons is transformed to a coordinate system in which the stage pole of motion between the two isochrons is moved onto the geographic north pole [Roest et al.,1992]. Then intermediate isochrons were linearly interpolated along plate flow-lines. This is equivalent to interpolation along small circles about the stage pole. The complete set of isochrons for each stage was subsequently rotated back into the geographic reference frame. This was done for each isochron pair on each plate pair.